The win could reverberate beyond Alberta, setting the party on a collision course with PM Justin Trudeau’s Liberals over climate change. The government recently imposed carbon taxes on four of Canada’s 10 provinces for failing to introduce their own plans for tackling climate change. The UCP’s victory ends four years in power for the NDP, whose 2015 victory rocked one of Canada’s most conservative provinces. The 28-day election campaign in Canada’s fourth most populous province centred around its uneasy economic future. Voters in the country’s oil heartland are worried about the state of the economy amid slumping commodity prices. 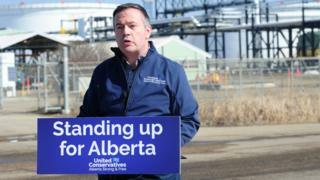 Mr Kenney campaigned as a champion of the oil sector, promising to fund a “war room” to defend Canada’s energy resources at home and abroad. His 2017 UPC leadership campaign has also come under scrutiny amid allegations his camp colluded with a “kamikaze” candidate to discredit his main rival.